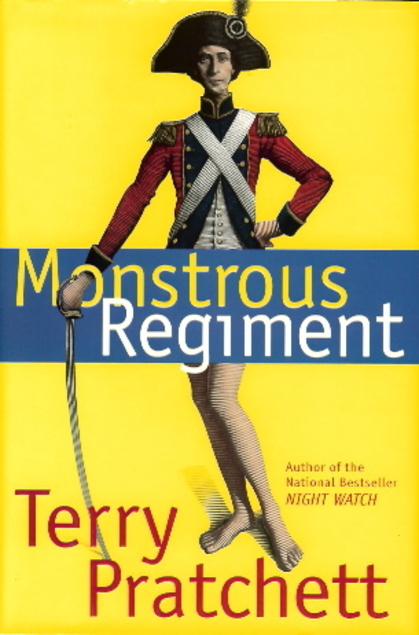 Monstrous Regiment by Terry Pratchett has been on my radar as a soon-to-read Discworld novel, so when I needed a new audiobook and it was available–perfect! This turned out to be one of Pratchett’s more overtly satirical novels. It was still funny, but there were also some darker elements highlighted. This one takes out of the familiar territories of Ankh-Morpork or Lancre, to Borogravia, a tiny country fighting a war against all its neighbors. Polly’s brother Paul went away to war some time before, and now Polly has decided to set out in search of him–by joining the army disguised as a boy, of course. She joins the last party of recruits heading for the front, a motley group including a troll, a vampire and an Igor (pretty much what you’d think). It become quickly clear that nearly all are girls in disguise, although their commanding lieutenant remains blissfully unaware of that fact. Meanwhile, Borogravia’s war is disrupting transcontinental communication for Ankh-Morpork, and Commander Vimes of the Night Watch has been sent to handle the situation. Pratchett is at some of his gender-political satirizing best here. A thematic issue since the third Discworld book (Equal Rites) he’s fully engaging here. There’s much discussion of how the world feels different (and regards the girls differently) when they do something as simple as putting on a pair of trousers. I don’t think (I might be wrong) that Pratchett ever directly states that women are as capable as men (but not necessarily wiser or more interested in peace). He simply tells a story that shows equality between the genders in no uncertain terms. It’s far more effective that way. The book also satirizes religion in some ways, which can always be a sensitive topic to explore. I’m practicing Catholic and one of my reading goals for the year is more spiritual books, so clearly I’m engaged here–but I felt comfortable with Pratchett’s story. He had a deft enough touch that I felt he was specifically satirizing extremism and religion without benefit of rational thought–and there’s plenty in that kind of religion to alarm. Pratchett also brings in a thematic strand about war. He’s very far from the type to glorify battle, and never shies away from the muck and practicality of life. Here I thought he actually went a little farther than usual, particularly in discussing some of the soldiers coming home from war. The worst (he says and I agree) are the pale ones with their jackets cinched up tight in place of bandages. That’s a haunting image. He also gets at the civilian cost in a country on the brink of starvation because everything’s gone to the war effort. It’s heavy stuff from an author known for humor–well-done, but heavy. It’s not all heavy though. There are many funny moments, and a good collection of characters. Polly is our lead, and while at first there seemed to be quite a large assortment of people to keep track of, by midway through the book I had the whole recruiting party straight. Polly is a typical Pratchett heroine (that’s a good thing), imperfect but well-intentioned, who is usually intent on hiking up her skirt or hitching up her breeches and getting on with business. I love that about Pratchett’s heroines. Not only are they not maidens in distress, they simply don’t have time or patience for that kind of nonsense because they’re busy living. Vimes was an unexpected treat in this one. He’s only a small supporting character, but his subseries is my favorite in Discworld (closely followed by Tiffany Aching, who’d get on well with Polly) so it was fun to see him here. The regiment’s lieutenant is also particularly funny, a paper-pusher who has read all about war and military strategy, blissfully unaware of his own ineptitude or, for that matter, his obliviousness. My favorite moment may be when they need someone to disguise “him”self as a woman. All the girls disguised as men are willing, but the male lieutenant insists he’s the best man for the job. This is not mostly one of Pratchett’s laugh-out-loud Discworld books, but it’s one of his more insightful and pointed ones. And even non-funny Pratchett can be pretty funny by spots. Highly recommended–but Pratchett is almost never not! The thought of a whole squad made up of women who secretly joined the army disguised as men is hilarious and delightful. Can’t believe I’ve never thought of it.